When you have to get off your tackle box, walk 10 pegs down the lake to borrow a third keepnet, you think things can’t get any better … they can when you fill it up! Despite Graham Carlyle weighing in a mega 139lb from Pool 5 on The Glebe at Peckleton in Leicestershire, to win the first day match of the third year of the prestigious and well-supported Ivan Marks Memorial Match, postman Mick Stamp (44) from Alford near Skegness wanted a big piece of the action on day two … and he got it! Drawing peg 23 on Pool 1 at The Glebe, Mick, twice a qualifier for the Embassy Challenge fished in Spain and therefore experienced in major events, went to work for the first part of the match casting a feeder tight over, fishing a cage feeder loaded with Dynamite Baits Swimstim green pellets, hemp and a plug of groundbait, using hair-rigged Sonu S-Pellets to entice nine carp between three and four pounds. However, during this time the Windmill Tackle sponsored angler had been priming his pole line, feeding caster and hemp at 13 metres, in an attempt to get fish feeding up in the water. The switch came before the two hour mark, and keeping a catapult in hand, six pints of casters were despatched into Mark’s peg, using a longer line from pole tip to float so as not to spook the fish. 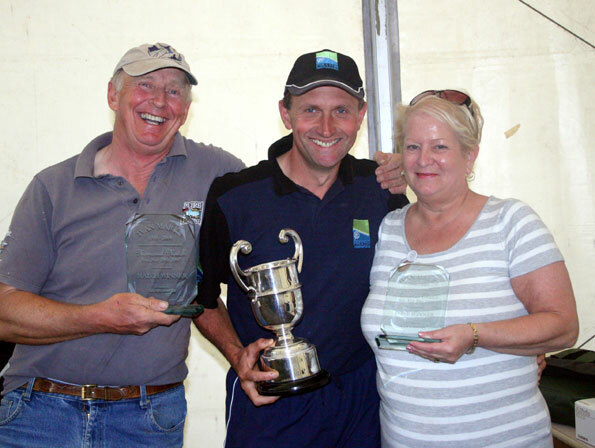 Left: Fishery bos Roy Marlow, centre winner Mick Stamp, right Ivan’s widow Linda. Fishing just the head of a ‘Dendra’ on the hook, carp to 10lb-plus fell quickly as he continually lifted his bait up and down in the water to tempt fish. 20lb of ‘silvers’ also intercepted Mark’s size 16 PR 29 mounted hook bait, but with a full hour of the match remaining, the ‘caster larder’ ran out and was replaced with meat and pellet simply to keep the ‘splash factor’ of bait going in, resulting in an awesome match-winning weight of 165lb 4oz, comfortably clear of runner-up Rob Wooton with 156lb 13oz taken from Glebe Pool 1 peg 28.